Give subviews max and min sizes, specify which subviews should resize, set divider colors, and hook up buttons to collapse subviews with animation – all from inside Interface Builder. Create preferences windows and tabbed sheets without writing a line of code. Note: This is currently in an experimental phase. Not recommended for use in production apps. BWToolkit contains a suite of controls for HUD windows including: a button, pop-up button, check box, slider, text field, text view, table view, and a check box cell. Add an anchored button bar (to be placed directly below a view), anchored buttons, and unanchored buttons (+/- buttons that aren’t anchored to a view). 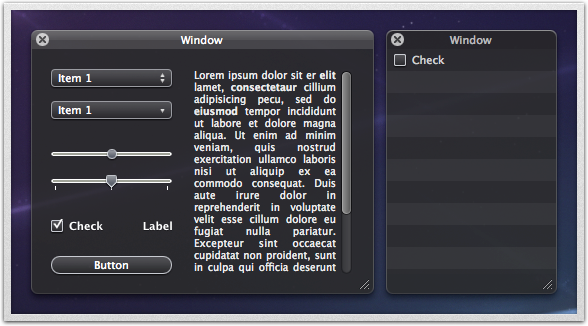 See your window’s bottom bar in IB while you’re creating your interface. Choose from four sizes: mini, small, regular, and a large one for sheets. Rapidly create and prototype sheets with the Sheet Controller. Sheets added to your nib or xib will even work in the Interface Builder simulator. Specify the identifiers of your toolbar items right in the inspector. Useful in cases where you need to access toolbar items from code. Add an iTunes-style slider to your bottom bar with built in speaker and photo indicators. For displaying text, use the provided inset text field. Easily add hyperlink text and images to your interface. The fonts and colors toolbar icons from the recently released iWork ’09 are provided. Add a gradient box to your interface with customizable border and inset lines. Apply a gradient and a shadow to text right from within IB with the Styled Text Field. BWToolkit is an Interface Builder plugin that contains commonly used UI elements and other objects designed to simplify Mac development. Double click the BWToolkit.ibplugin file to load the plugin into Interface Builder. Interface Builder will keep a reference to this file. Store it in a location where it won’t be deleted. Open the Xcode project you want to use the plugin with. Right click the Linked Frameworks folder and select Add ▸ Existing Frameworks. Select BWToolkitFramework.framework. Right click your target and select Add ▸ New Build Phase ▸ New Copy Files Build Phase. For the destination, select Frameworks and leave the path field blank. Drag the BWToolkit framework from Linked Frameworks to the Copy Files build phase. 10.5 users: Build BWToolkit from source. See a list of known issues, file bugs, and submit feature requests on our issue tracker. To contribute code, send me a patch over email.